Modern Fish Finders are basically small computers with special software designed specifically to show the user what’s happening under and around the boat. Not all fishermen are technology savvy, so it’s no surprise that many people don’t understand the fish finder basics. Honestly, the fish finder manufacturers should do a better job educating their customers, and the internet is full of myths and bad info. If you are confused about how to read your new fish finder, this tutorial can help you understand how a fish finder works, and how to read a fish finder screen in terms anyone can understand. How Does a Fish Finder Transducer Work? What do Fish Look Like on a Fish Finder? Most fish finders are sold as a fish finder GPS combo, meaning they come with the fish finder head unit, a GPS receiver (either external or internal), and a transducer. 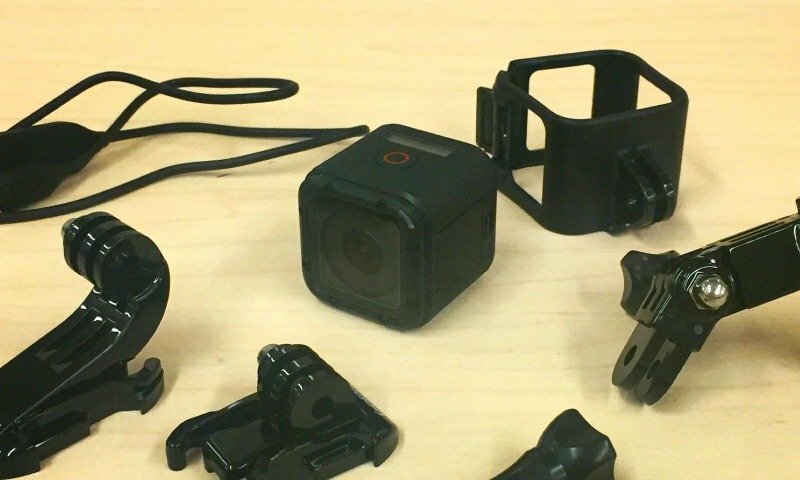 There are also many accessories that can be connected to fish finders, like networking devices, Bluetooth, and advanced sonar accessories like 360 Imaging, and Panoptix. This guide will cover only the basic features of a fish finder that you would have out of the box. If the head unit is the brains of a fish finder system, then the transducer would serve as the eyes and ears. The transducer is where the real work of detecting what is below and around the boat, which sends the data to the head unit and the software works it’s magic to paint it onto the screen. Transducers come in a wide variety of shapes and sizes, but they all perform the same basic function. They have piezoelectric elements (like ceramics) inside that vibrate at certain frequencies, emitting pulses of sound into the water column. For each “ping” of the piezo, there is a return signal. The time and strength of the return is converted to an electrical signal for the head unit to process. This is what Sonar (Sound Navigation and Ranging) is. Transducer elements come in different sizes and shapes depending on the desired frequencies. Traditional 2D sonar uses round shaped elements, while imaging elements are usually rectangular to create the thin high frequency signals needed for imaging. CHIRP elements can operate in a wider band of frequencies, sometimes called broadband sonar. If your fish finder has GPS capability, it can chart your position and track on top of a map. 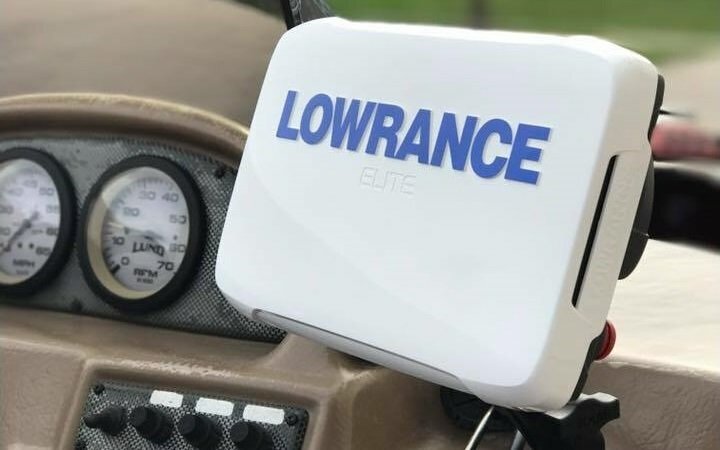 Most top fish finders today use an internal GPS receiver, but an external receiver can be used to show boat position heading direction even at very slow speeds. A good GPS and lake map is a very useful tool for fishing. It is great for navigation, scouting for fishing areas, and for making waypoints to be able to return to those exact spots at a later time. Newer Humminbird and Garmin fish finders have special software that allows an angler to create custom maps of unmapped waters using whatever transducer that is hooked up to the unit. All you have to do is idle over an area in a crisscross pattern, and the software builds the map. It’s like magic watching the bottom contours come to life as you go. Fish finders come is sizes from 3.5 inches all the way up to 16 inches. In general, going with the biggest screen you can afford is the way to go, so long as you get the sonar features you want. The larger the screen, the more information you can view at one time. A 5 inch screen is hard to view both the chartplotter and sonar side by side, but it looks perfect on a 9” or larger screen. The other point to consider when looking at screen sizes is the pixel density. Many times units in the 5, 7, and 9 in sizes will all have the same resolution. The top manufacturers currently have displays using 800×480 pixels in the 5, 7, and 9 inch screen sizes. For each size up, the pixel density decreases, and the images become slightly less crisp. Most people feel the increase in size makes up for the decrease in pixel density. This is where seeing the units side by side in person can help in making a buying decision. Depending on the fish finder brand, units can be networked directly between themselves, or with a hub. Humminbird uses an Ethernet based system, while Lowrance and Garmin use a NMEA2000 based system. Ethernet is plug-and-play, while NMEA 2000 is a bit more technical and useful for extending the network to all parts of the boat like the engine and radar. Reading a fish finder screen is one of the basics that everyone should learn, but somehow gets lost in the technology. It always amazes me to meet someone who has a $1,000 fish finder but doesn’t know how to use it properly. Don’t be that guy, put these short lessons to use, and you’ll improve quickly. Traditional sonar uses a cone shaped beam to read the water column. The angle of the cone depends on the frequency. 200 kHz has a wider cone than 83 kHz, and thus has a larger area of coverage, while 83 kHz has better detail. The fish finder is constantly pinging and listening, and then paints the returns onto the screen. The newest returns are on the right, and the older moves to the left. Now imagine you are sitting still, the screen will show the same depth, and the bottom will look flat because you are sitting over the same spot. If a larger fish were to swim through the cone, it would appear as an arch on the screen. The arch forms because the distance to the fish at the outside of the cone is longer than directly in the middle. Now imagine you are idling over a reef with brush on the sides and rock on top. As you drive up the slope, the depth on the screen changes along with it. Brush can look like a mess of fish, or blobs on the screen. You will usually be able to see the brush connected to the bottom, which tells you it’s not fish. Why do things like groups of fish or brush look like blobs on 2D sonar? Brush, trees, and dense groups of fish can appear like indistinguishable blobs. The reason for this is because the transducer picks up everything inside the cone. Down Imaging sonar has a much narrower beam, returning only what’s in the narrow beam slice, which creates the lifelike pictures. 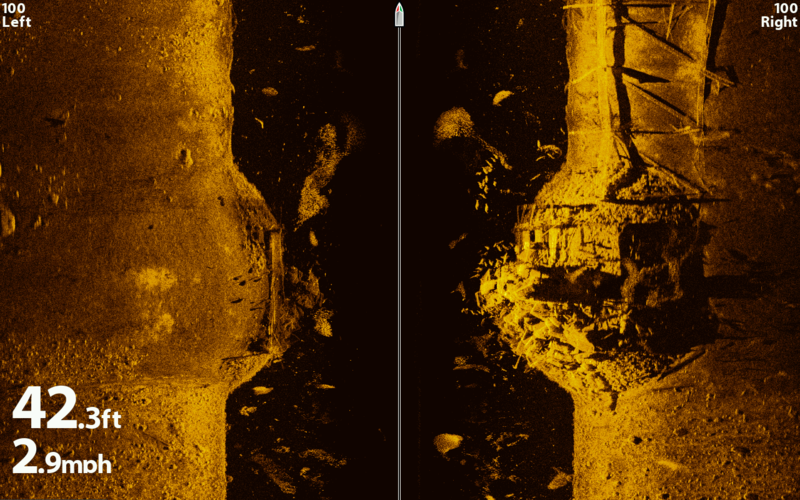 What does hard bottom look like on 2D sonar? Depending on your color palette, hard bottom will have a bright yellow color return, with a thicker band of blue below it. As you move past the hard bottom to a mucky bottom, and the yellow blue returns will fade into an orange color. 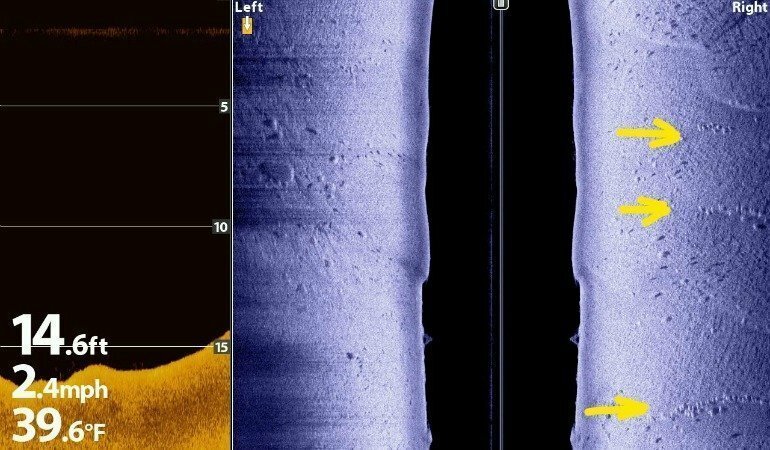 What do fish look like on sonar? Fish can appear as round marks, arches, or clouds if they are baitfish. Larger fish will have a solid color in the center because a big fish has a solid mass to return a strong signal. Should I use Fish ID? Fish ID is somewhat controversial, but it can actually help you determine where fish are in relation to your cone. See this article for more. Even so, many anglers prefer to not have the screen cluttered with fish symbols and would rather do the interpretation of fish themselves. What do fish look like on Down Scan/Down Imaging? This is probably the most commonly asked question ever about down imaging, since it’s different than the traditional sonar most people are used to. Fish look the same as they do on 2D sonar, only smaller because the Down beam is a narrow slice of the water column. Crappie will look like small ovals or circles, typically stacked on top of each other in schools around weed beds or timber. Schools of bass will be spread out on the bottom and a little larger. Spotted bass tend to stack up on top of each other more than largemouth. What does hard bottom look like on Down Scan/Down Imaging? Hard bottom is very easy to see on imaging views. Depending on your color palette, it will look a little brighter than soft bottom, and will have a thicker band of color underneath it. If you can idle over some bars or humps, you will clearly see the color change where the bottom transitions from soft muck to harder bottom (sand, gravel, or rock). What do fish look like on Structure Scan/SideVu/Side Imaging? Fish can be a little tougher to spot since the side imaging beams are looking out to the side rather than directly overhead. Fish will have brighter returns, and if they are off the bottom at all you should see their sonar shadow. The distance between the fish and shadow can tell you how suspended the fish are. Fish that are hugging tight to a hard bottom will blend in and be difficult to spot, but fish on soft bottom will stand out with the brighter returns. Baitfish will look like cotton balls. Click here to learn how to use side imaging.